21.30. That's in the evening and you will be travelling in the dark most of the time. You won't see much of the landscape! You 'll have a cabin with 4 beds (4 persons) and washbasin. The price is really fair. Two adults and two children will cost you RM 160. When the sun rises near Alor Setar, you can have a look outside. Around 8 o'clock the train arrives in Aarau. Here you get off the train and you'll take a taxi to Kuala Kedah for the ferry to Langkawi. This taxi will cost you around RM 14. Still there are two sections very interesting for us, as tourists: The "Eastern Oriental Express" and the "Jungletrain"
The Jungletrain is more basic. You can choose a hard seater or a soft seater, there are air-conditioned compartments and there are non air-conditioned compartments. In the last you will meet the local people, travelling to another kampong or there are girls/boys going to school. The Eastern and Oriental Express has a lot of luxury. The train is going from Singapore to Bangkok and stops in every interesting city's along the railroad (Malakka, Kuala Lumpur ,Butterworth (Penang)). In these places the train will stop for some hours, so that the passengers can make an excursion. This train is expensive: 1500 US or Euro. 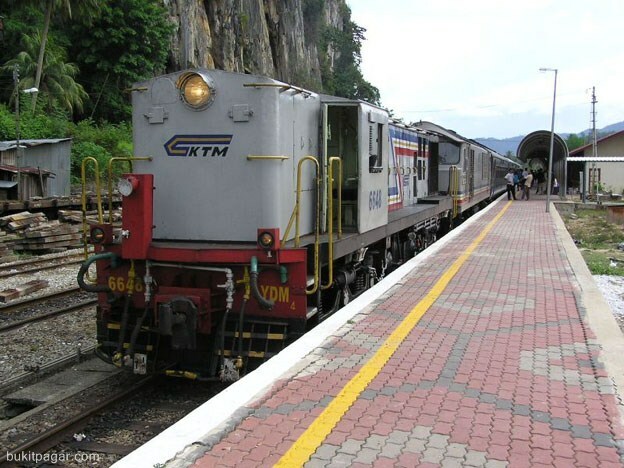 The jungle train is travelling through the jungle from Gemas to Tumpat, which is near Kota Bahru (10 km). If you want to make that trip, you have to do South to Gemas. Maybe you can stop for a night in Malakka, which is a very interesting town with its colonial history. 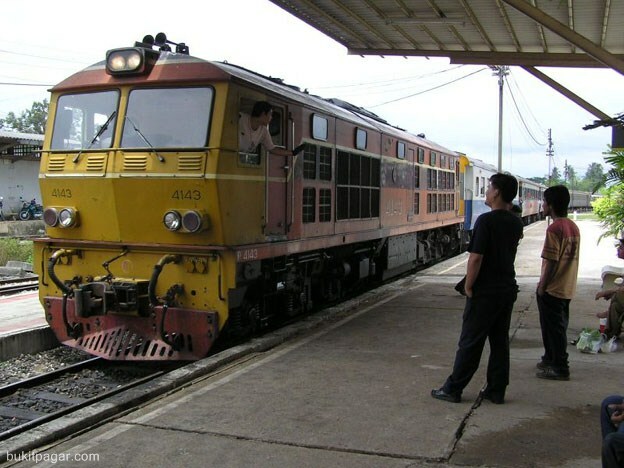 From Gemas the train will go North to the Thai border (Tumpat). When you come for the first time to Malaysia, then it will be better to visit the National Park Taman Negara at first. You'll come back out of the jungle by boat at twelve o'clock from Taman Negara to Kuala Tembeling, In Tembeling you can take a taxi to the nearest station. Probably this will be: Mela or Jerantut. Plenty of taxi's will be waiting for you to bring you to the nearest station. The train will leave at 13.00 hours, so you don't have to hurry. The passage to Tumpat will take 8 hours. Late in the evening you'll arrive in Tumpat. From the little towns Jerantut or Mela the train will go North and you will be travelling through the thick jungle. 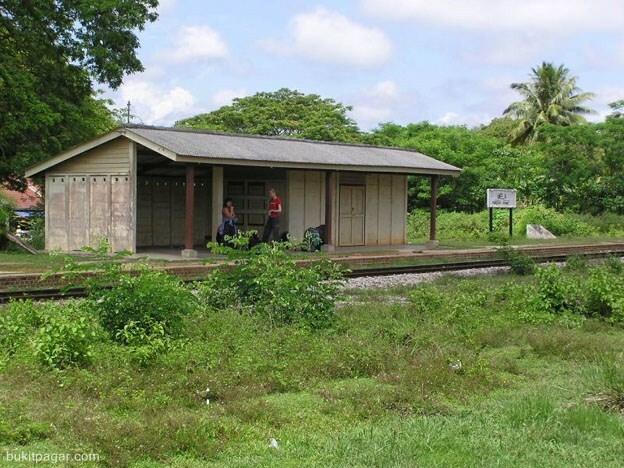 The train will stop at a kampong to let passengers in and out. Sometimes schoolgirls, which are going home, sometimes a local who wants to visit some relatives. The whole stretch has only one track. Every time the train stops (8x), the vendors will come so sell you eggs, litchi's, cake or those plastics bags with lemonade. As a foreigner you are a an "object of interest". Specially when you have chosen for a hard seater (wooden bank). The locals don't even dare to sit beside you. Just invite them to sit next to you. Untill Gua Musang you will see nothing but jungle and sometimes a kampong.Near Gua Musang you get more view of the landscape. The green jungle is behind and you will see more rice fields. You're arriving late in Tumpat, but don't worry, a lot of taxi's are waiting to bring you to Kota Bahru, the capital of Kelantan. The taxi-driver will take you to the hotel you want, even when you haven't booked. There's a daytrain and a nighttrain on the track from Gemas to Tumpat.The daytrain is stopping more often then the nighttrain. It's obvious, that the daytrain does the track in shorter time, because less people are getting of the train. "Our departure was on Saturday from Mela. It was quit busy on the train, because of the school holidays, I think. We had chosen for a hard seater, because we thought it was only 8 hours on the train. Later on our mood became more pessimistic, because it took a long time. There was only one track for the train. We had to stop for some time, wait three quarters of an hours and then the train moved along. Then again stopping, waiting three quarters of an hour and again moving along. That was about six times. Indeed there were air-conditioned compartments, but we booked one without airco. Sometimes people went to the these air-conditioned compartments to cool down. It seems, that the night express is moving much faster. The last stretch (Gua Musang - Tumpat) was very beautiful: there were mountains and we had a lovely view. In the jungle you'll see only green. Just trees and sometimes a kampong. Every time, when the train stops, the locals will come to sell you snacks or drinks. Children were staring at us on the train. No one was sitting next to us. We invited them to sit next to us, but... when you're 8 feet tall..... We didn't look so strange! Finally we arrived at 11 o'clock in Tumpat (near Kota Bahru). To hours later then planned. There were a lot of taxi's waiting to bring us to Kota Bahru. We were tired and maybe we paid to much for the taxi ride, but he went with us to several hotels. Most of them were fully booked, because of the school holidays. But he gave us the right address for a a wonderful stay on the Perhentian Islands: Suria Resort or Coral Bay."